Don’t be fooled by size. Since this little powerhouse is a JBL speaker system, you can have faith that it delivers great JBL sound. The JBL OnBeat aWake offers just the right amount of power for your bedroom — whether you’re rocking loud or soft. Listen to music, watch movies and play games – and do it all wirelessly. 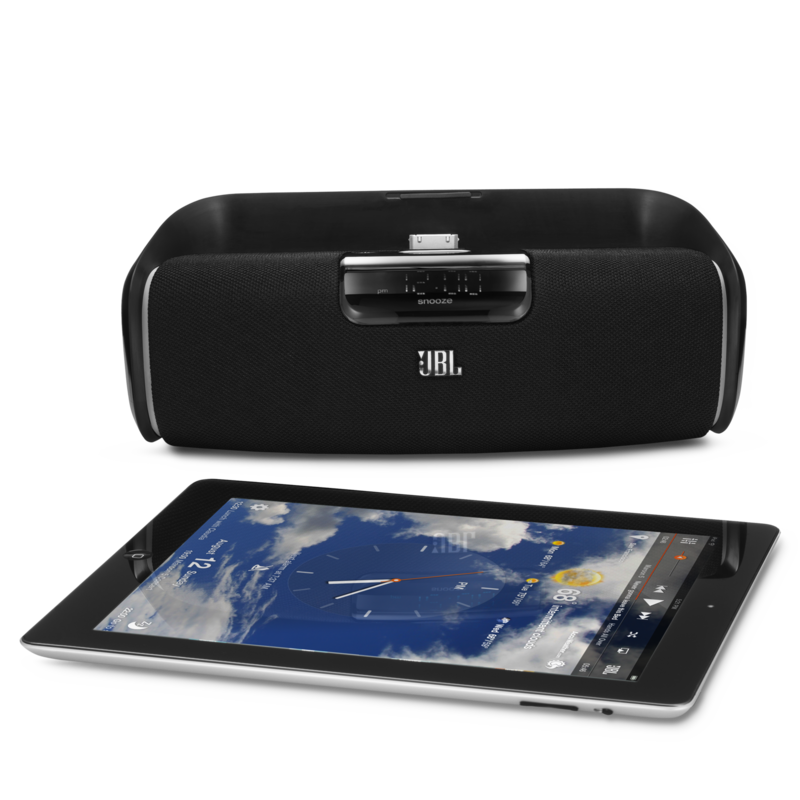 We’ve designed the JBL OnBeat aWake for your iPad, but it also works with your iPhone, iPod touch and virtually any other audio player that uses Bluetooth technology. The HARMAN TrueStream technique is our guarantee that you will enjoy the best possible listening experience when you’re streaming audio wirelessly via Bluetooth technology. Because you have many options for Bluetooth connectivity, our products always use the most current and most advanced option to ensure the highest-quality sound no matter what application or source device you use. JBL Slipstream port technology gives listeners powerful, great-sounding bass with low distortion. Whether your source is docked or streaming, you’ll experience bass that you can really feel. The JBL OnBeat aWake’s full-range transducers provide room-filling sound. Hear clear highs and mids, plus exceptional bass – all from your tiny bedside companion. Whether your device is Bluetooth-enabled or not, the JBL OnBeat aWake allows you to take full advantage of its incredible sound, thanks to its auxiliary-input (aux in) connection. You can use practically any digital audio device, including MP3 players, smartphones, tablets and laptop computers. Rather than waking up to shrill sounds, you can serenely open your eyes to your favourite music. Download the free JBL AmpUp companion app, which allows you to customize your wake-up theme, choose a lullaby that helps you fall asleep to music, and access your daily calendar. We know that everyone would like some extra shuteye when the alarm sounds, so we made it easy to reach. Smart-touch snooze controls allow you to tap the bedside table for extra sleep. This work of beauty isn’t just for your iPad. You can use it with your iPhone and iPod touch. The JBL OnBeat aWake can dock and recharge both as well as the iPod nano and iPod classic. There’s no need to squint in the dark – the JBL OnBeat aWake prominently displays all of your information, including the weather, time, calendar and currently playing music track, on your iPad. We’ve included easy-to-access brightness controls to help you read the integrated clock when you need a little extra light. Meet the JBL OnBeat™ aWake iPad bedroom speaker system. Designed for your iPad and other iOS® devices such as your iPhone and iPod touch, this speaker dock allows you to wake up to your favourite music rather than the harsh sounds of a traditional alarm clock – particularly if you download the free JBL® AmpUp™ app, which lets you fully customize your wake-up call. Equipped with Bluetooth® connectivity and the HARMAN TrueStream™ guarantee of the best available wireless connection, the speaker also gives you the freedom to stream music, watch movies or play games wirelessly. And, of course, it provides the famously clear and accurate JBL sound that has filled arenas, theatres, concert halls and other venues worldwide. Powerful drivers, Slipstream port technology, an auxiliary input for additional source devices, an easy-to-read screen display, a dock charger for iOS® devices – the JBL OnBeat aWake has virtually everything you need by your bedside (except a good book). You could enjoy it so much that you may set it to wake you even on days when you don’t have to.